Team Smith: Stop! Hammer Time! My baby looks like M.C. Hammer in these pants! 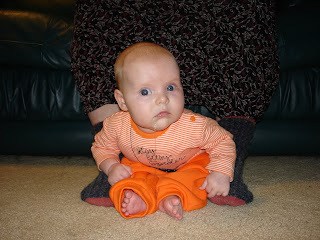 So I wanted to be all festive with Sierra's 1st holiday but they only had a 3-6 month pumpkin sweatsuit. The top is so cute, it has a jack-o-lantern face on it and the hoodie has a stem on the top, transforming her into a little pumpkin. I did find this really cute onesie. 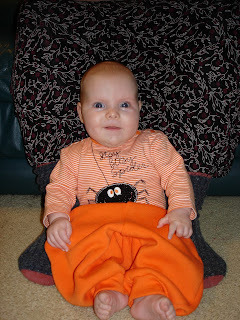 She's my Itsy Bitsy Spider! I have these little pumpkin slippers too that match the outfit, but she hates having things on her feet so the shoes come off in .02 seconds every time. I think they look like temple slippers (but orange). The outfit as a whole is adorable but I don't really think orange is her color. Maybe some day I'll have another kid that this outfit will fit better. I'll post another pic of her next week in the full ensemble. I think she thinks her right side is her best side as you can see from the pose she's giving. Really it's just that a massive amount of drool is coming from her mouth and she wanted us to be sure to get it in the picture. She's adorable even when she's gross! I have the most drooly baby ever, and she's not even teething. Heaven help us when that starts! We've Got a Talker on our Hands, Folks!